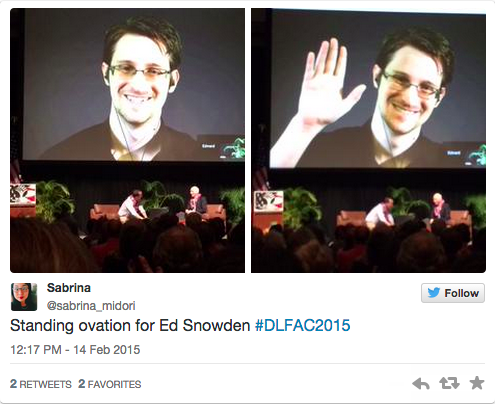 It’s Valentine’s Day, and there I am, at the Hawaii Convention Center hanging out with Edward Snowden. Yes, that Edward Snowden. Him, his lawyer, the ACLU, a few FBI agents and Homeland Security types, and 1000 of his closest friends. Of course, he’s not actually there. He’s in Moscow – or that’s what they tell us – but when the laptop wielding tech guy joined the Google hangout, there was Ed, live, up on the giant multi-story screen at the front of the room. As we say in Hawaii, I got chicken skin. The instantaneous and sustained standing ovation and cheers shook his laptop, he told us when it all died down and folks took their seats. He seemed taken back by all the hoopla, almost shy, and happy to be back in his adopted home, even if only virtually, and only for this 90 minute discussion facilitated by the local ACLU chapter. I’ve been one of those people who kept up with the Snowden news somewhat casually, never really giving it a lot of bandwidth. I felt a slight connection, knowing he lived here before booking it to Hong Kong just before the stories broke, and I was fascinated by the 40 days in the Moscow airport. But beyond that, I admit to being one of those who smirked at the thought of the NSA keeping tabs on my emails and cat videos on Facebook – the “I have nothing to hide” type. Ninety minutes with Ed, his lawyer Ben Wizner, and like I say, 1000 of his closest friends, and I’m not that “I have nothing to hide” type anymore. Now first, let me say this: I get public relations. Been there. Done that. Made a decent living at it. I understand messaging and identifying your audience and sound bytes (something Ed might need some help on, by the way. Turns out he’s a dork who can carry on for a bit.) Ed and the ACLU are on a virtual media tour making news across the country. Let’s be clear: it’s a public relations strategy, maybe to get Ed’s side of the story out, maybe to spark more discussion, maybe to try to create sufficient buzz that Washington might find a way to get this guy home without sending him to solitary for the rest of his life. And just like Ed wants us to know the NSA is spying on us, I want to know the rationale behind this PR strategy, its timing and its end game. But for the moment, I’m setting that aside. I know it’s Kool-aid and I’m drinking it along with the other 999 people in the room and it’s quenching a deep thirst. And I’m getting back in line for a refill. When something touches a nerve, makes me think, makes me question some of my own previously held beliefs – well, that’s not just PR anymore. That may just be the beginning of something bigger. One of the first problems with the whole Snowden story is it’s complicated. How many of us really understand meta-data, what it is, and how it’s used, aside from our in-depth research through Law & Order and NCIS? I know my bank claims to encrypt my information, and I basically believe them. I know Amazon knows what I want or need, often before I do, and I’m both appreciative and spooked. And this year, I actually clicked through one of those highly targeted ads on Facebook to order the perfect Christmas gift that really was the perfect gift. And that scares the crap out of me. Snowden likened the NSA’s mega-data spying to hiring a private investigator to check up on your spouse or kid. The PI isn’t sitting at the table with them, listening to their conversation, nor in the hotel room, nor on the plane they both have seats on. But piece together the connections and pretty soon there’s a story to be told. Now make it meta-data from two cell phones. No one ever listens to the conversations. But someone, somewhere – with the complicit knowledge of our phone carriers – tracks the phones. First, the phones show up on Kailua or Lanikai beaches from time to time, occasionally at the same time, but sometimes at different times. Ditto with the Honolulu Club. Eventually these two phones start calling each other, often at night, and often for extended conversation. No one hears the conversations; it’s just data on a screen. A few days later, the screen data reports these two phones are at Roy’s at the same time, then the phones settle in at the exact same location. All night. And again tomorrow night. And the night after that. Voila! Never have voices been heard or secrets shared, but that meta-data just confirmed that two beach loving, Honolulu Club going, fine dining souls have found each other and sparks are flying. And we know their names. And just in case we forget that real live people are working behind those screens of tiny data points, Snowden casually pointed out that according to his intel, NSA staffers have on at least eleven different occasions used that meta-data to track people in their personal lives. Think about that. Government bureaucrats sitting in front of screens all day and their minds wander to old flames or their boss’s odd habits or the neighbor who always leaves nasty notes. Makes Facebook stalking seem like the Crayola party in preschool. Of course, we can’t talk about cell phone meta-data tracking without talking about the “war on terror” and national security. And maybe at one point in my life, maybe right after the towers fell, that made sense to me. But then Ed made a pretty compelling argument. According to him, terrorists stopped using the cell phones in 1998. “All the terrorists using cell phones are now dead,” he said flatly. And I immediately remember the Osama bin Laden raid, and the in-depth reporting on how it was gum-shoe tracking that found him, because there were no devices in use anywhere, by anyone, under surveillance. Point made. Reflecting on his time in Hawaii, Snowden brought it home. He talked about how, when he’d go to the beach by himself – no phone, no girlfriend – he’d swim for a bit then sit on the sand and realize he was completely alone. Completely alone. When did that become so precious and so rare? “People shouldn’t have to become digital insurgents,” Snowden insisted when pressed about what individuals can do. “The Googles and Facebooks can do encryption,” he said, reminding the audience that technology now makes privacy practices widely available, affordable, and easily done. They just aren’t choosing to do it. And we, their customers, really aren’t making much of a fuss. Pressed to justify breaking the law to do what he’s done, Snowden had the predictable, yet sobering, response. “If people did not break the law, we wouldn’t have had the American Revolution. If people did not break the law, we’d still have Prohibition. If people did not break the law, we’d still have slavery. If people did not break the law . . . . ” Fill in your own ending. Our history books and civil evolution are full of righteous examples. He’s not much older than my oldest son, and as such, he barely remembers the towers falling. And those of us who do remember, maybe we place too much weight there. Yes, they fell, and for so, so many of us, it remains one of the darkest days of our lives. I lived in Washington DC at the time and can still feel the sheer panic that permeated my city for months. We worried about anthrax. We bought gas masks. Every low-flying plane stuck fear, as did any forgotten briefcase on the Metro or unmarked car on the street. In that moment, regardless of our own resolve and PR, the terrorists won. We were terrorized, and as such, maybe we lost our objectivity, our sensibility. 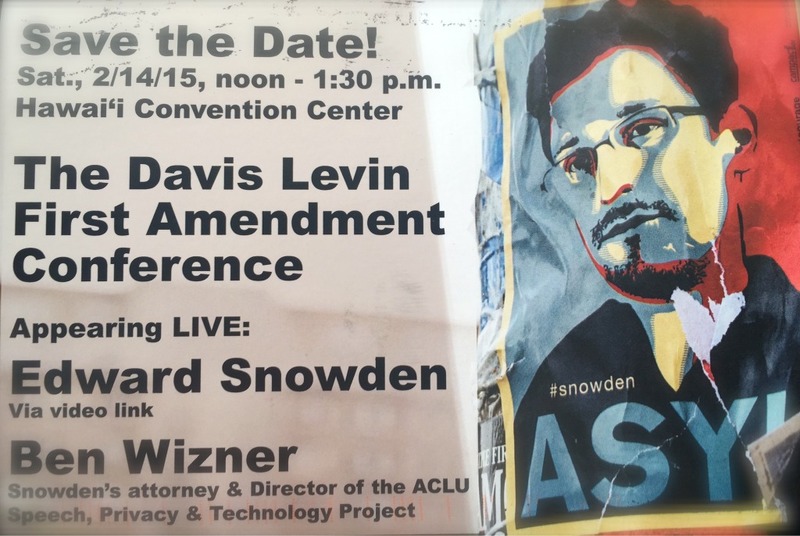 I believe Ed Snowden will be in the history books my grandchildren study, and my two younger children will be able to share stories of the time they went to the Convention Center to hear him, watch him on the big screen, and listen to him explain why he did what he did. Whether Snowden will share company with Rosa Parks and Paul Revere, or find himself in chapters along side Julius Rosenberg remains for history to decide. But as for me, I’m pulling for him. Secrecy and deception can not be a cornerstone of this country’s future if we continue our claims as a nation of freedom. A year or so ago, a lot of ink was being given to the heightened emotional state of folks at 30,000 feet, traveling from here to there. Just as this Atlantic article reported, we seem to be more contemplative, more apt to tear up and have a good cry. I’ve spent a lot of hours on airplanes, and confess that I’ve done it – spent those hours thinking, wondering, reflecting, even crying a bit. As I reflect on Ed Snowden, now making a life in Moscow while he awaits whatever comes next, I think about that long flight from those solitary beaches in Honolulu to an unknown and frightening fate in Hong Kong. At twenty nine years old, he left a note on the counter and everything else behind – a well-paying job, his family, his girlfriend, his life as he knew it – to spill secrets he knew could ruin him at best, and potentially kill him. From what depths did he summons the courage and the capacity to release those files and step on that plane? What might this young man have been thinking on that long flight? I was twenty-nine once, and the one thing I know for sure is that I could have never stepped up that high nor taken that leap. Could you? To view the entire session with Snowden, please click here.